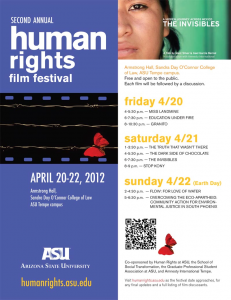 Screenings include “Miss Landmine,” “Education Under Fire,” “Granito,” “The Truth that Wasn’t There,” “The Dark Side of Chocolate,” “The Invisibles” and “Stop Kony” on April 20 and April 21. On Sunday, April 22, Earth Day, “Flow-For Love of Water” and “Overcoming Eco-Apartheid: Community Action for Environmental Justice in South Phoenix” will be screened and discussed. All films will be shown in the Sandra Day O’Connor College of Law’s Armstrong Hall (Grand Hall), and each is followed by discussion—a few with the filmmakers themselves. Visit humanrights.asu.edu/node/12 for the full schedule of events and bio information on film discussants, which include a number of ASU faculty members and students as well as community activists.